View our eastern cape tour lodging that we use on our Eastern Cape Cultural tours.The lodging is all local,no big chain hotels, all adding to this special memorable Eastern Cape Cultural tours experience. We visit Nelson Mandela childhood village. Meet guests in East London Airport and drive to Alice.We can pick you up in Port Elizabeth as well. If we have time,we will show you parts of historic East London,visit a township,and a local soup kitchen.These activities depend on what time you arrive into East London. We will visit the Art Gallery in Fort Hare University popular for its breathtaking art collection.The art work here is done by African artists. It depicts life in the Townships and rural areas, as well as life during the struggle. You will have time to walk through the campus, and if you have a particular interest,we can arrange a meeting with a local University academic for a short discussion. Proceed to Bisho where will visit Steve Biko’s home and Steve Biko Garden of Remembrance where his grave is.Steve Biko died in the hands of the South African Police while on the struggle for the liberation of the oppressed in South Africa. On the way we will stop by to see the a local creche( day care center) started by Steve biko and his wife. As well there is a medical clinic that we can visit as well, that was also started by him as well. We overnite at the Kings Place..the palace of the King. 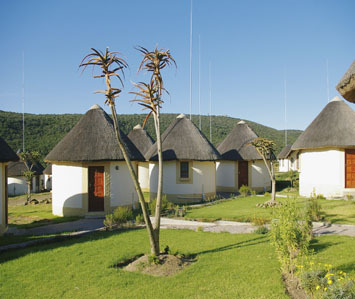 The complex which has 40 rondavels (roundish Xhosa traditional houses). These rondavels depict 40 tribes that they represent and each with it`s own chief and they are also accommodation for guests visiting the palace. Kings Place Eastern Cape Cultural Tour Lodging. After breakfast we cross the Kei river to get to the rural areas of the Eastern Cape ..the locals love it as they get a free ride each time a car goes across . From here we will proceed to the Wild Coast via the Kei Mouth and cross the river Great Kei on a pontoon over to the Transkei homeland. 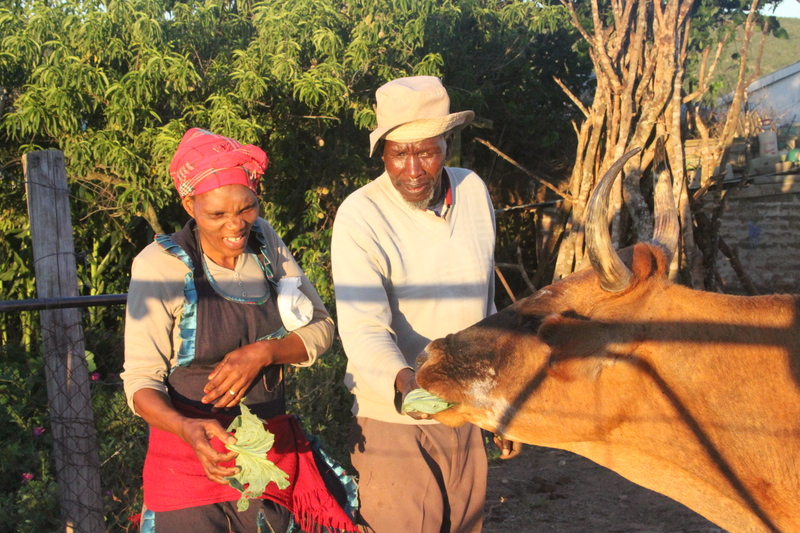 We travel all the way to the Wild Coast through villages experiencing the rural way of living. For Lunch traditional food will be organised in one of the villages. We will also be able to see and walk around Nelson Mandela`s home in Qunu village.Nelson Mandela is buried in a graveyard close to private preside. After visiting Qunu, we drive down to Coffee Bay. Coffee Bay is a sleepy little place on the Indian Ocean, surrounded by rolling hills, dotted with local huts/local gardens…its a place where time slows way down. Today is a free day and after breakfast you can choose from many different activities ie walking in the local hills among the local gardens, walk to hole in the wall, 4×4 drives to villages,sangomas(traditional doctors),walking trails,fishing , laying on the beach, the water is the warmer Indian ocean, river kayaking,visit a craft center, or enjoying a slow laid back day. After breakfast we will drive to the Umtata, East London or Port Elizabeth airport,to drop you of.